Some of you will have read Gretchen Rubin’s previous book, the mega-selling The Happiness Project, a book that seemed to capture the public’s imagination in a major way. So much so that it’s still appearing on The New York Times Bestsellers’ list some years after its release. In that book, Rubin sought to pursue a year’s worth of happiness, consciously attending to things such as cultivating love, aiming higher and keeping a gratitude journal. In her new book, Happier At Home, she embarks on a similar project, but this time concentrating purely on the domestic sphere. It is Rubin’s thesis that those things that we do and encounter every day contribute much more to our happiness than rarer and more pleasurable events. If we were to concentrate on making our everyday lives at home a source of our happiness, she says, then we would become infinitely happier. I absolutely adored this book, glorying in its unashamedly homely discourse and being constantly inspired by the ideas and projects that the author embarks upon. Whether it’s creating a shrine to nice smells (a silver platter filled with bottles of perfume) or exploring your local neighbourhood as though you were a tourist, Happier at Home is filled with so many practical tips and projects that you can emulate that, if you’re anything like me, you’ll have a notebook full of ideas when you’re only halfway through the book. Rubin’s slightly counter-cultural messages are refreshing: you can delight in staying at home and creating a wonderful family life; you don’t have to meditate if you feel you are not suited to it; and that constant simplification is not necessarily a path to happiness – sometimes possessions and things can make us feel really good. Her honesty and unpretentiousness take this book above the usual self-help offerings and are part of the reason, I think, for her extraordinary popularity. This is not a book that makes you feel guilty. Instead, it excites you and makes you aware of the possibilities for great happiness within your own sphere, however small. One of the really liberating techniques she has introduced me to is devoting just 15 minutes a day to doing the tasks that are really irksome - and that you have been putting off the longest. She is strict about this: she sets the timer for exactly 15 minutes, after which she puts it aside. What arises, however, is an immense sense of relief and achievement, and sometimes even a discovery of interest, utility and, yes, even happiness. Examples she uses are organising her digital photographs and reading the huge pile of printed-out journal articles that have accumulated over the years. Most of the pleasure of this book comes from recognising your own domestic situations and how you have been guilty of the same neglect and lack of attention. I cringed when she described the unused Sony Walkman (yes, the cassette-playing type) that somehow got put on top of some books on a shelf and which, she realises two years later, has been left sitting there for no reason at all. 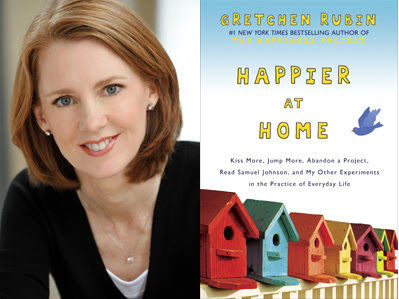 Happier at Home is a terrific read, and Gretchen Rubin’s tone is casual, personal and constantly diverting. Though her own journey is recorded as a month-by-month program, I read the book with great interest in just a couple of sittings, and derived a great deal from it. It would be even more fun to emulate her program, and deal with one topic for one whole month. It’s a beautiful book which would also make an excellent gift. I hope you will be as inspired by it as I was. Reader activists! You can purchase this book - or any other - and also give vital support to the Universal Heart Book Club by using our bookstore links (above right). We also love to have your comments. If you don't have a Google email, just use "Anonymous" and follow the captcha instructions to prove you are a real live reader (two words, space between)! Would be lovely to hear which of Rubin's ideas really resonate for you. I am also very aware how "home" is also a place of work for full-time parents and carers... who must also make it "home" (i.e. a place of rest and recovery) for those they care for. Women's relationship to home can be quite complex - and is often overlooked. This is different again from home being the office for self-employed workers, though that is complex too in its own way. Your thoughts?